Grocery shopping. It’s not something you do while you’re hungry. Because if you do, you’ll see something and say, “hmm, that sounds delicious!” If your’e right, you’ll eat all of it as soon as you get home because it is really as fracking delicious as you thought it would be. But if you’re wrong, you’ll question your wisdom in purchasing it in the first place right from the first bite (or sip). It sounded like a good idea at the time. No, really. Even after the horror that was The Gallon Challenge (we recorded it yesterday for the podcast, and it should be airing in a couple of weeks), there is no substitute for the real thing when it comes to milk. Not even if the box claims it’s vanilla flavored. And really, it’s the promise of vanilla flavor that did it for me. 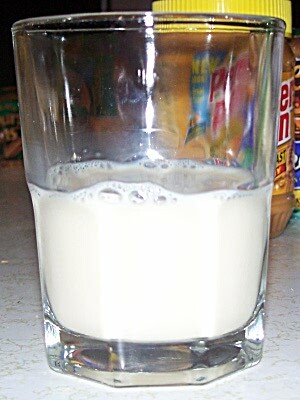 Now, I love a tall, cold glass of milk as it is, but do you know what would make it better? If it tasted like vanilla. Like ice cream, or a milk shake, or pudding. Vanilla is greatest flavor of them all, and if milk tasted like that I would never drink anything else. Well… I suppose that’s a little too good to be true. I poured myself a nice glass of the stuff. It sort of looked like milk–I mean, the texture was there, but the color… well, I’m not sure milk should be an off-white color. White, yes. Pure, creamy white. This stuff looked like the color you’d paint your bathroom trim. But no matter. As long as it had vanilla flavor, it would be acceptable. The verdict? Well, it was smooth and creamy. And there was a slight vanilla flavor to it. But there was also something else. Soy is not dairy, nor can it compare. It’s a vegetable, and so the whole drink had a strange vegetable-y, grain-y flavor to it. If you could make a creamy drink out of plain, cooked pasta, this is what it would taste like. Not that it was bad, it just took some getting used to. 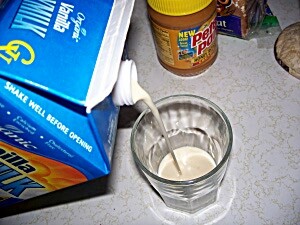 It did wash down a peanut butter sandwich fairly well, but not in nearly the satisfying and refreshing way that real milk does. So, yes, I will eat it, but I think I will stick with real milk from now on. 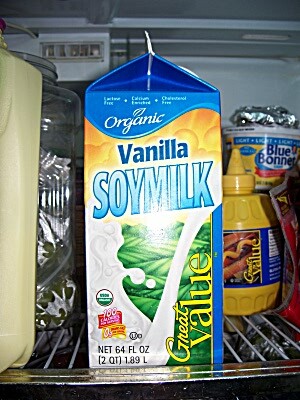 Even if this soy milk does tempt me with the promise of vanilla. Posted in: Will Dylan Eat It? on September 28, 2008 by The Maitre d'.